It's no secret that I love to entertain. In fact, my husband enjoys entertaining, too. We both come from large families, so we're very used to a large family gathering with tons of food. While a big family meal is very exciting and is often the star of the show, I feel that the appetizers often get overlooked, when, to me, they set the tone for any family or social gathering. Not all get-togethers are planned. Some just come to fruition at the last minute, and some may have been planned in advance, but let's face it- life happens and sometimes you may not have as much time as you'd like to prepare something fancy. The solution to your entertaining woes lies in a simple board... a cheese board, that is. I've you've been browsing Insta or Pinterest lately, you've probably seen some gorgeous ideas for cheese boards. Some of them are truly spectacular and look far too beautiful to eat. Last weekend, we were entertaining my father-in-law, as he was visiting from Ohio. He was over to our house for dinner on Friday night, and we had planned a simple pasta dish for dinner. After his long drive down to NC, I knew he'd be hungry, and dinner would still be a ways off. Putting out a cheese board is thoughtful, allows time for grazing, conversation, and it's also a great time to get the wine flowing! You don't have to spend a lot of money (or time) to put together a cheese board. I like to keep a few staple food items at home, just in case we have unexpected company. 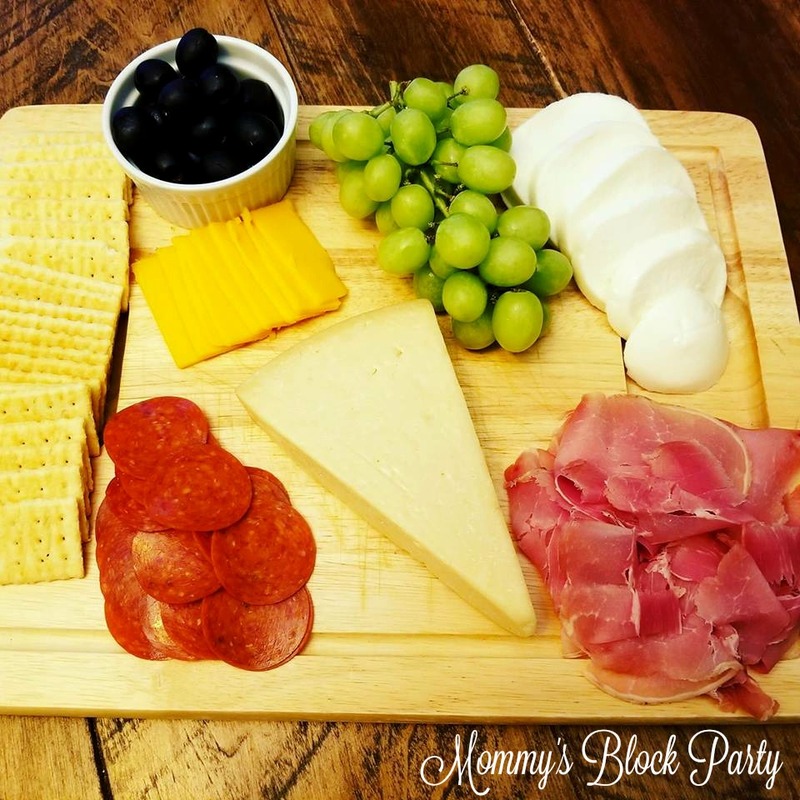 For a small gathering of 3-4 adults, I would stick with 2-3 cheeses, 2 types of meat, simple fruit, and of course, olives! You can also serve up crackers, crusty bread or breadsticks. Our cheese board consisted of fresh prosciutto, pepperoni, mozzarella, parmesan, and cheddar cheeses, black olives, and green grapes. We also put out a row of crackers. If this cheese board were for my Italian family, I would focus more on crostini or a hunk of bread with dipping oils, meats, cheeses, and tons of olives, along with grapes. You can add just about anything to your cheese board that is fresh and pretty. Add in sprigs of fresh herbs if you want to make it look even more picturesque! The trick to making your cheese board pretty is to add a lot of different elements, and pile them in groupings right beside each other- and it's okay that the different foods touch each other! The cheese board can serve as an appetizer, or as a snack or main course... just depends on the crowd, and perhaps the vibe of the gathering. Don't forget the wine! It's nice to have both red and white wine to offer along with what's on your cheese board. I wouldn't recommend going with anything that is overly sweet or too dry. A simple red table wine or Cabernet and a Pinot would be just fine. Have you ever put together a cheese board? What do you typically add to yours? Let's talk cheese boards and entertaining in the comments below or over on social media. Chat with me at @mommysblockparty on Facebook or @mommysblckparty on Twitter and IG. This looks tasty! I've actually never put together a cheese board before.